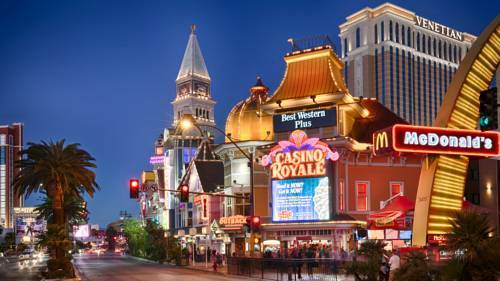 The Best Western Plus Casino Royale is located on the center strip. Las Vegas hotels are known for their luxury, but guests deserve to get a great deal and great customer service, too. Our Las Vegas Best Western features low table minimums for your convenience and enjoyment. A great atmosphere, cheap drinks and an onsite casino get you into the Vegas mood as soon as you arrive. The rooms in our Las Vegas hotel are cool, spacious and clean. We believe you really can have it all, and our property proves it. Las Vegas Strip hotels have you steps away from world class dining and entertainment, whether it's taking in a show or braving the rides. We're adjacent to Caesar's Palace and the Venetian , so the best of the city is literally at your doorstep. Walk to the best shops, visit the famous landmarks and never worry about being far from the action. This Las Vegas hotel is directly across the street from the Mirage Volcano, a must whenever you come to the city. The Sands Expo and Convention Center is also nearby, so if you're here for an event at that location, it's easy to walk there. Located on the Las Vegas center strip, there's no reason to overpay for a well-appointed and clean room. With one dollar Michelob drinks and happy hour all day, we cater to the environment our Las Vegas hotel guests want and expect. The Thomas and Mack Center is close, so if you have to get there for an event, it's only a few steps away. Whether you're here for the Las Vegas Convention Center, planning a weekend away or have to take care of business, depend on us to provide you with equal parts quality, service and value. The Nellis Air Force Base often brings travelers to our Las Vegas hotel. We welcome service men and women along with their families, and it's easy to slip in a little fun and leisure even if you're on the job. With the best of the city just steps away, you deserve a little down time. Enjoy your stay. Noble Roman's Pizza, on premises, fast food, Italian, open for: lunch, dinner, open Monday through Thursday 10:00 a.m. to 1:30 a.m. and Friday, Saturday 10:00 a.m. to 2:30 a.m.
Cinnabon , on premises, cafe, American, open for: breakfast, open Monday through Thursday 7:00 a.m. to 10:00 p.m. and Friday, Saturday 7:00 a.m. to 11:00 p.m.
Ben & Jerry's , on premises, ice cream, American, open for: lunch, dinner, open seven days a week 9:00 a.m. to 11:00 p.m.
Outback Steakhouse , on premises, full service, American, open for: lunch, dinner, open daily 11:00 a.m. to 1:00 a.m.
$2.49 Footlong Hot Dogs, on premises, fast food, American, open for: lunch, dinner, open Monday through Thursday 10:00 a.m. to 2:30 a.m. and Friday, Saturday 10:00 a.m. to 4:00 a.m.
.30 mile(s) from High Roller at the Linq, The Largest Ferris Wheel in the world is now open!